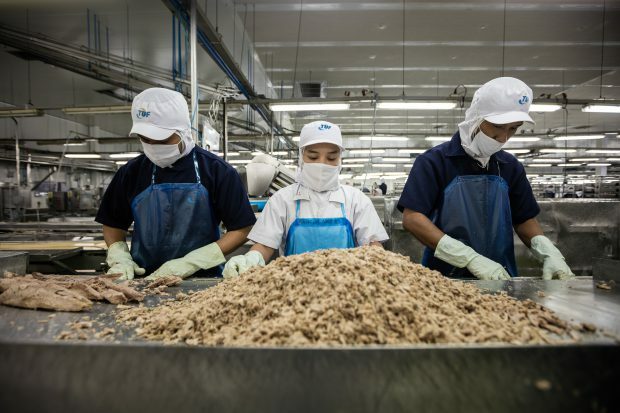 Thai Union have been front and centre in the debate about both human rights and fishing, and seafood sustainability around the world in recent years. Greenpeace continue campaigning against the company on Tuna and fishing devices. Meanwhile the company has made significant progress on human rights issues, in a challenging operating environment. Some campaigners might argue this is from a low base, but a turnaround is a turnaround, and should be noted, no matter when it comes and why. I recently moderated a conference session on all this, with Darian and Steve Trent from EJF, along with Walmart. The podcast I taped afterwards with Steve Trent is here. After that, I thought, well, why not send Darian some questions too? And so I did. Here’s what happened. Toby Webb: Tell us a little about yourself. How did you come to run sustainability at Thai Union? I imagine the role wasn’t front and centre at your school careers fair. Darian McBain: I am an engineer by training and have spent my career working with businesses and governments on sustainability, in both Australia and the UK. The role of procurement and supply chain management to influence sustainable outcomes has been apparent to me for many years, well before responsible sourcing became a job description. I had just finished my PhD (studying social impacts in global supply chains) and work with WWF on palm oil in 2015 when I was approached for the position at Thai Union. It was a great opportunity to work for a company that is committed to change and leadership, in an industry that was in the spotlight for its environmental and social practices. When I started my career, it was unusual to have a sustainability manager in companies. Now, I report directly to the CEO and speak to investors, customers, suppliers, regulators – there is nothing like a crisis to spur innovation and drive new approaches to old problems. TW: There’s a bit of confusion about who owns which brands in the fish/seafood sector. Can you clarify for the readers which brands TU owns, and where you operate? DM: The infographic below shows where Thai Union operates and the brands that we own. We own brands as diverse as such as John West in the UK, Chicken of the Sea in the US, Petit Navire, Parmentier, King Oscar, Mareblu and Rügen Fisch across Europe, as well as brands in Asia including Sealect and Century. 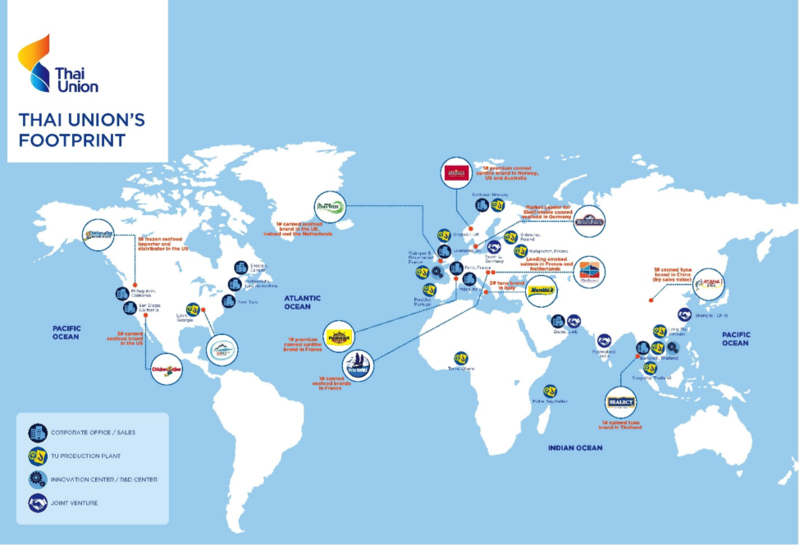 Our processing facilities are located around the world, including Thailand, US, Vietnam, France, Portugal, Poland, Ghana and the Seychelles. We also co-manufacture for a number of brands and retailers. Although our headquarters are in Thailand, Thai Union is a very much a global company, sourcing about 3% of our fish from Thai waters. TW: Leadership. You’ve mentioned to me that the Thai/Chinese owners at TU have had their “Road to Damascus” moment on human rights and sustainability. What caused that, and how are they now trying to change the industry from the top? DM: Thai Union is a listed company, but very much based on family beliefs and values. At the most basic level, the family that founded Thai Union want it to be a company that they can be proud of and that upholds their own values. It is the only company that I have ever had an interview with that emphasized the need to be humble (in terms of your ability to constantly learn) and responsible. I think their “Road to Damascus” moment was with some of the early journalism investigating slavery and illegal fishing in the Thai seafood sector. Thai Union does not want to be associated with the illegal industry, and actively wants to show leadership on these issues. The approach is to work closely and collaboratively with our stakeholders, base our decisions on science and data, and share our steps on a journey towards sustainability. I don’t believe any one company or even one country can resolve the issues faced in the region on human trafficking and illegal, unregulated and unreported (IUU) fishing. However by working with our partners, particularly local NGOs, and acting transparently we can show that there are solutions available to help put human rights and sustainability at the heart of our business. TW: Human rights in Thailand’s seafood sector. Much done, much still to do, goes the old cliche. Where are we now, and tell us about the changes TU has made, and the results? DM: A bit like the Alcoholics Anonymous process, I think that admitting that there are problems in the industry is the first step to resolving them. Some of the external forces to Thailand, such as the European Union yellow card to Thailand on IUU fishing, and the investigative journalism undertaken on human rights abuses in the Thai seafood sector, have been drivers for real change. There is certainly much more to do, but there are equally certainly some things that we have achieved recently that make me very proud. Full traceability of all of our fish from the Thai fleet back to vessel to reduce the possibility of IUU fish entering our supply chain and the mandatory use of the Marine Catch Purchase Documentation system has been a real achievement, as well as audits of vessels on social standards. We have done some amazing work with local NGOs including the Migrant Workers Rights Network (MWRN), Project Issara and the Labour Rights Promotion Network (LPN) and I credit a lot of our success in addressing human rights issues to our close partnership with them. This includes the provision of an independent, third party hotline in five languages with Project Issara to all of our factories and increasingly the ports in which we operate to give workers a voice and grievance mechanism; the social dialogue based audit program established in our factories with MWRN to improve our dialogue with workers and the development of our zero recruitment fee policy; and building child care centres in collaboration with LPN in local schools to support the children of our migrant workers. TW: I have to ask you about FADs. Fish aggregation devices, which are seen as unacceptable by some campaign groups, but not all certification bodies. You mentioned to me it’s not so simple as “pole and line + good, FADs = bad”. Tell us your views. And are you asking MSC to certify a FAD fishery? DM: We support the International Seafood Sustainability Foundation’s approach that no gear or method is perfect, and that comprehensive management is the goal. The use of a well-managed non-entangling FAD can eliminate the need for live bait fish as required by Pole and Line fishing, as well as being carbon efficient because the vessel can go straight to the catch area. The living and working conditions on a purse seine vessel might be better than those on a long line or pole and line vessel. Local community cooperatives fishing using traditional fishing methods can have great community sustainability outcomes but aren’t necessarily scalable for commercial fishing. The sustainability of the fishery towards the MSC standard is just as important, if not more, than the gear type because MSC is based on a holistic approach, taking into account the sustainability of the fish stocks, the impact on the environment as well as the way fisheries are managed. I think there are lessons to learn across the industry on fish stock sustainability, traceability and human rights, but we need to base decisions on fact rather than emotion, and be outcome focused. As the world’s population grows and with it demand for protein sources, the only solution is that we work together with all players across the industry for sustainable outcomes. TW: Is it fair to say TU have pushed some sustainable sourcing targets back, as campaigners suggest? What’s the context here, and what are your headline targets and deadlines now? DM: Our commitment to sustainability has not changed. As a Group, we have consolidated sustainable sourcing goals with the launch of our Sea Change program to demonstrate transparency on our direction of travel as we move towards 2020. We have committed that fisheries from which we source will either operate at MSC standards or are engaged in a Fishery Improvement Project or Conservation Project to bring them towards the MSC standards. We also committed to providing full traceability of our tuna supply chains from catch to consumption. That is a big step for a group as big as Thai Union, has the power to change ocean outcomes, and supports our numerous customers on their journey towards sustainability as we provide them with their requirements ranging from FAD-free, MSC, to Pole and Line sourced fish. None of these certifications can be turned on and off instantly and it takes long term planning which is why we have set the long range goal of 2020. 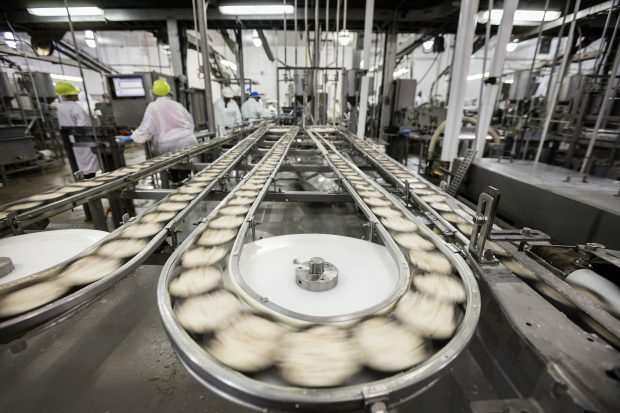 We also have extensive programs on Fair Labour, and can demonstrate significant progress. 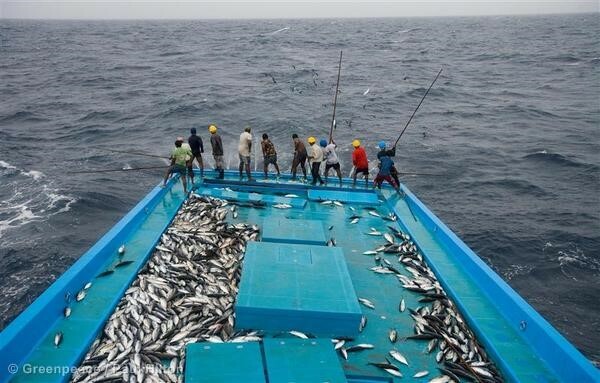 Many of the goals, such as full traceability for tuna, have already been achieved. The challenge of making commitments is the price of failure. We see this in climate change negotiations most frequently – the terror of committing to a goal when you are not sure how you can achieve it. Are we better committing to a stretch goal and failing, or not making any commitments for fear of failure? I would say the former, some campaigners would seem to promote the latter.